Not a fan of email? 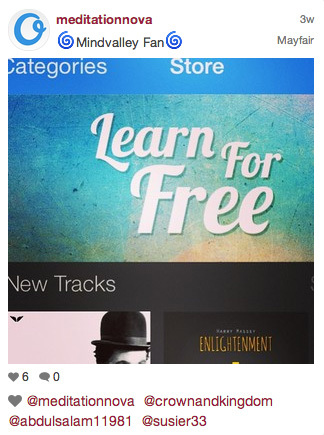 Omvana gives you 100s of meditation tracks from world famous teachers at your fingertips. 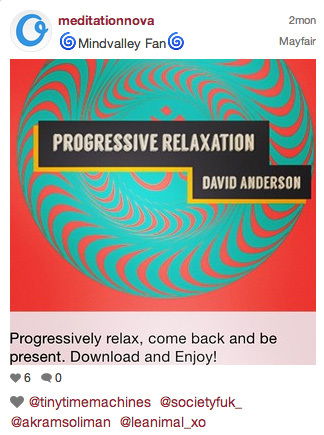 Hit play and get meditating in minutes. Omvana is a tool that plays on any browser, Chrome, Safari or Firefox. It allows you to instantly get access to the world’s greatest collection of transformative audios. 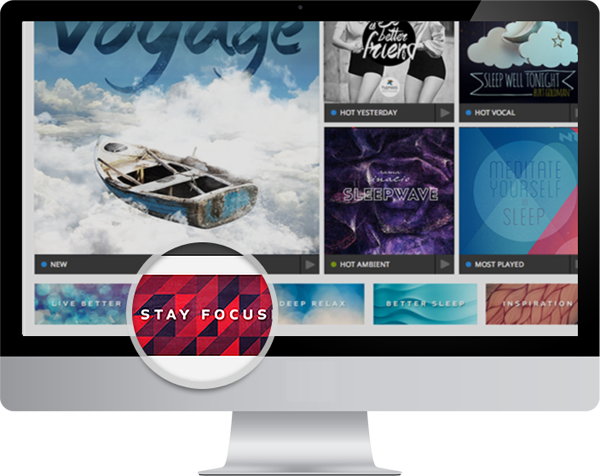 Sleep, Relax, Meditate, Get Inspired and Do More – All by playing a track on Omvana. And that’s not all…as you read below you’ll see other advantages that have made Omvana the #1 personal growth tool on the planet. Omvana for Web is an evolution of our iPhone App which hit the #1 spot in Health & Fitness in 30+ countries and received rave reviews from 1.5 million customers all around the world. And according to science it helps us live longer, stay younger, focus better, be more productivity and even makes us happier. Yet many us don’t do it right. CUSTOMIZED FOR YOUR NEEDS: Omvana lets you CUSTOMIZE your meditation for your needs (Focus, Relax, Sleep, Visualize, Hypnosis, Spiritual Awakening and more). LESS THAN 3 MINS: Don’t have time? Omvana lets you choose from 3 min to 1 hr long meditations. Our 3 min meditations are perfect for busy people. STAY AWAKE: Can’t keep awake during meditation? Omvana lets you customize the track to include brainwave frequency beats that keep you alert and focused during meditation. STAY FOCUSED: Our guided meditations are perfect for people who are a little more ADD and can’t always keep their minds clear. MAKES IT EASIER: Think Meditation is too tough? 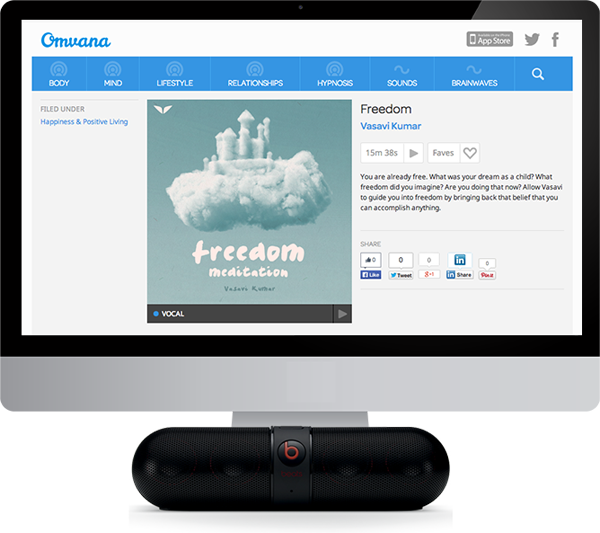 With Omvana it’s as easy as plugging in your headphones and clicking play. FUN: No learning curve required. No difficult postures. Omvana is fun and easy. HEALTH BENEFITS: Get ALL the benefits of meditation instantly. You will notice results in days. VARIETY: Get access to a variety of different meditation tracks for a variety of different problems – sleep, focus, memory, productivity, happiness, relaxation and more. In Omvana, you’ll find guided meditations by famous authors, teachers and coaches that are scientifically proven to help you enter deep meditative states… to allow you to reap of the medical and psychological benefits of meditation. Choose from tracks of varying lengths ranging from 3 mins to 30 mins or from different categories like relationship enhancement, career boosts, goal settings, happiness, peace of mind or dozens more categories. 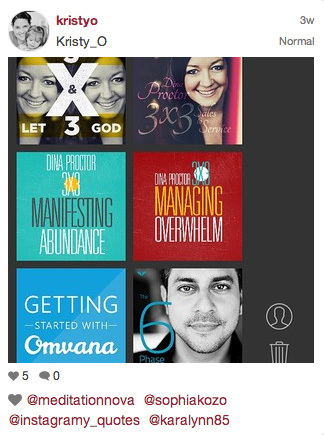 Omvana features hundreds of inspirational tracks, music and poetry to get you inspired to live an extraordinary life. You’ll find tracks that’ll satisfy your creative needs and challenge you to live a more fulfilling life. Use Omvana in the background when you’re on the treadmill, driving, cooking or working out. If you’re looking for an effortless way to achieve laser-sharp focus and develop a goal-oriented mindset fast, Omvana’s focus tracks are a must-have. With Omvana you choose from a variety of different brainwave entrainment sounds designed to keep you alert, focused, refreshed and productive. In Omvana, you’ll find numerous stress-busting relaxation sounds that’ll help you relax, rejuvenate and refresh your body. When you’re in a relaxed environment, you tend to make better decisions in life. You can even play ambient sounds to create a relaxed environment in any room. Many spas use Omvana audios for this purpose. You’ll find in Omvana a variety of powerful sleep-inducing tracks that you can just click play to experience refreshing, rejuvenating deep sleep. With this simple change, in your resting schedule, you ‘ll see immediate results. These tracks are not just engineered to help you get better sleep, but you can even choose tracks for lucid dreaming, waking up refreshed or taking a quick power nap. in every area of your life…. Do you have a specific problem or goal you want to achieve? Pick the appropriate category that reflects your need – peace, focus, meditation, better sleep, or just a little inspiration. Choose from hundreds of tracks. There’s bound to be something that fits your need. Let’s say you’re looking for positive living. You might try Lisa Nichols’ “Discovering Your Worthiness”. This is a vocal track, meaning spoken words. Now choose an Ambient track (background sound) to go with the vocal track. 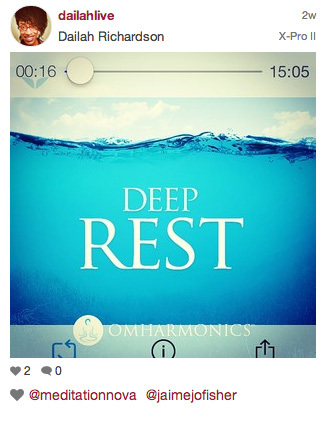 Our custom engineered ambient tracks help you relax, meditate, sleep, or perk up. For example, if you are listening to Lisa Nichols, you might pick an ambient sound designed to inspire. If you’re listening in the morning before starting your day, pick an ambient suitable for sunrise. You can adjust the volume of the Ambient or Vocal to suit your preference. Find a spot to sit back and relax and listen. 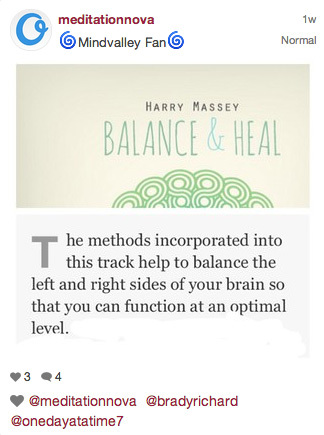 Commit to your daily brain-love regimen, listening to just one track per day. And soon you’ll see remarkable shifts in your life. Relaxation sounds help you relax, rejuvenate and refresh your body. If you make everyday decisions while you’re in a relaxed environment, you tend to fare better in life. Less mistakes, less frustration, less guilt and more happiness for you. Many tracks on Omvana use specialized brainwave entrainment technology to allow you to relax even faster. schools such as the Silva Method or OmHarmonics. Visualization works great for achieving any of your goals. It is an intricate process by which you can carefully craft out your future in a more precise and creative way. This simply is the quick and painless way to achieve your dreams and goals. 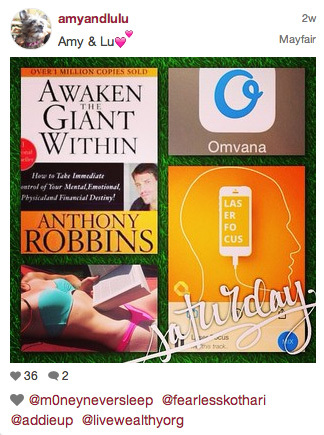 Omvana includes creative visualization tracks from many legends in the field like Lisa Nichols or Bob Proctor. 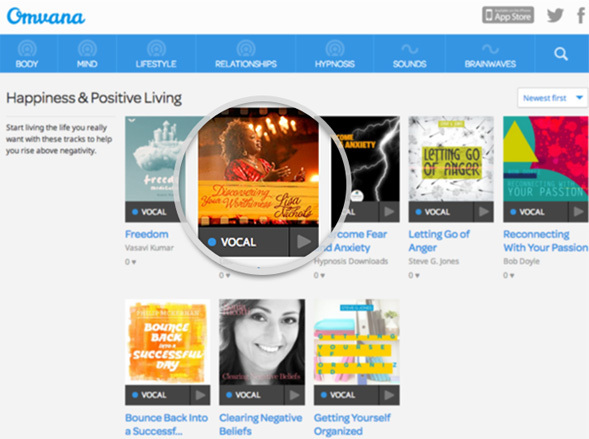 Omvana features powerful inspirational tracks, music and poetry to get you inspired to live an extraordinary life. You’ll find tracks that’ll satisfy your creative needs, motivate you to dream bigger and challenge you to live a more fulfilling life. to kick out, then look for the Hypnosis Tracks. well known hypnotherapy institutes and coaches. Become a lean, mean, “get-things-done” machine at work. So you get that raise and hit those deadlines with minimal stress. Omvana’s collection of focus and productivity tracks has your back. Our engineered collection of sleep sounds will not just help you sleep like a baby, they also include programs to help you remember dreams, wake up on time, and take power naps. An app based on our sleep tracks recently became the #2 most downloaded Health app in America in April 2014. That’s how hot our sleep tracks are. Daily meditation is proven to reduce stress, anxiety, and fears, even if it’s just for a short period of time. Omvana contains dozens of tracks that you can listen to when facing anxiety so that you can calm down in a mere 3 minutes. 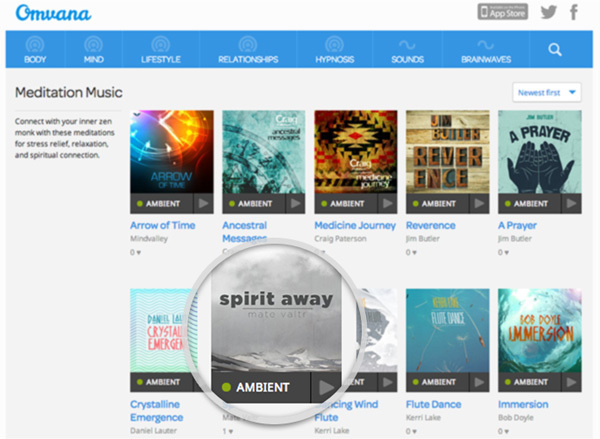 Omvana comes with hundreds of tracks designed to elevate happiness. These range from brainwave entrainment sounds to personal growth practices from famed institutions like the Silva Method and creative visualizations based on scientifically backed mindfulness practices that elevate happiness. Use Omvana brain entrainment tracks to sooth and massage your brain so you can relax in the most stressful situations in minutes. Plus you’ll look all zen and calm in the midst of chaos. 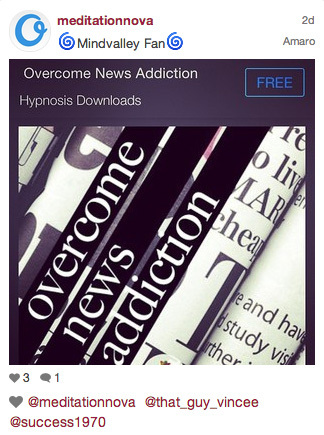 Omvana comes with a big library of Hypnosis tracks to help you overcome bad habits like over-eating, smoking, and more. You’ll also find tracks designed to instill positive new habits like gratitude, mindfulness, reflection on daily goals and more. Studies consistently prove that as stress levels go up, your immune systems weaken — causing your overall health to deteriorate. So why not use the stress-alleviating brainwave entrainment and mindfulness tracks in Omvana to improve your immune system and enhance your body. You’ll get 25 of the best exercises, guided practices, visualizations, brainwave entrainment, hypnosis and inspirational talks that are carefully handpicked by our team of personal growth enthusiasts at Mindvalley absolutely FREE. 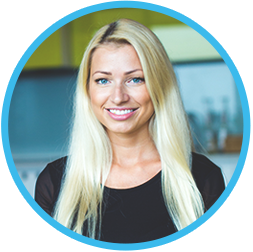 Our team works with many of the top experts in the fields of meditation, hypnosis, brainwave entrainment and more — and brings their work to Omvana so you can get instant access to the world’s best audios. With Omvana, your possibilities become endless. 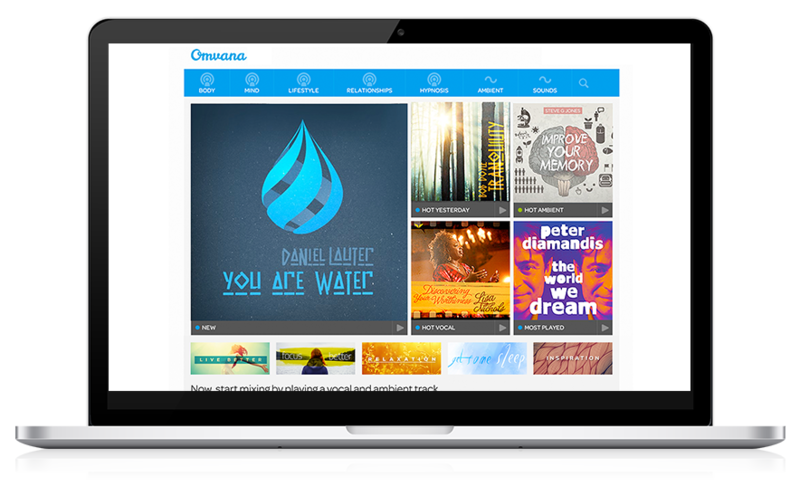 When you sign up today, you can use the Omvana platform and enjoy its many benefits with 25 of our best tracks available to you instantly – absolutely free. Our mission at Mindvalley is to make meditation accessible to millions. That is why we would love you to be able to enjoy it at no cost. Here are just some of the Top tracks our users are listening to right now. Omvana to help manage stress. I downloaded and started using Omvana to help manage stress. So far it seems great, thought some of you would be curious. Called #omvana. Check it out. Good for relaxation and meditation. A brilliant idea that will totally transform the way we meditate. I have only scratched the surface of how I will use this application and I have so many ideas running through my head. I can’t wait to get started creating my own meditation sequences and downloading more from the Omvana store. I cannot praise Mind Valley enough for the brilliant creation of this application.Standing Ovation!!! I think this is the greatest app ever. We listen to it almost every night. 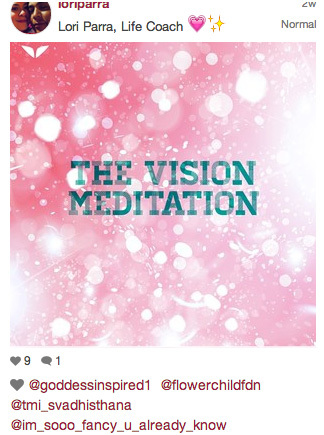 Great sounds and meditations. There is just so much here to chose from. Everyone will find something. I am totally impressed. Best app I’ve ever put on my phone! Thank you, thank you, thank you!!! What a treasure thank you! 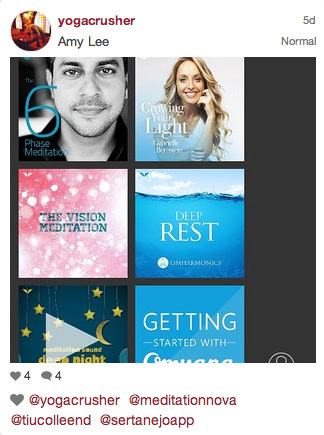 Just downloaded the new #meditation app #omvana from vishen & @mindvalley. Love the inspirational talk & the mixer. Am so excited about this app Thank-you for making it available to us. Omazing! My favorite app #omvana Choose different calming background music w/ powerful spoken meditations! #Free @mindvalley U All Rock! ABSOLUTELY LOVE THIS APP!! MEDITATION ON THE GO! Please check it out! #omvana. Absolutely Awesome!! I LOVE IT!! The new way to meditate. This app is amazing. The meditations are excellent. The recordings are high quality. But the best part is the MIXER!! Brilliant and empowering. I love mixing different sounds with different guided meditations or just listening to sound while I’m working. Can’t believe I can have this whole powerful library right on my phone, with me all the time. Another superb product from Mindvalley. Thank you Vishen!! This is a super cool #meditation #app that I love. Lots if cool and different options. I love doing walking meditations when I can. I also love the sleep ones for my children. I practice a specific meditation each day, but these are great. Definitely the coolest new app. Binaural Sounds. Get familiar. Tweak your frequency. #omvana. 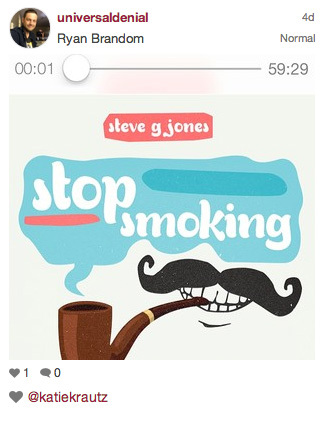 Thank you so much for all these wonderful meditations to download on my iPhone! You never know where or when you’ll need a few moments of guided meditation and now I can have it anywhere! You are so very generous to have made this offer available to try today and I am sincerely grateful to your company! I have already listened to several of the tracks and WOW, LOVE them ALL! Thanks again!!! I didnt even know there were meditation apps out there, but i’m certain nothing can compare to the top notch products that Mindvalley put out there! This might just be the best app ever…! Ready for bead cause I have a dream #omvana – Try it now! Amazing idea, have been waiting for something like this for quite a while!